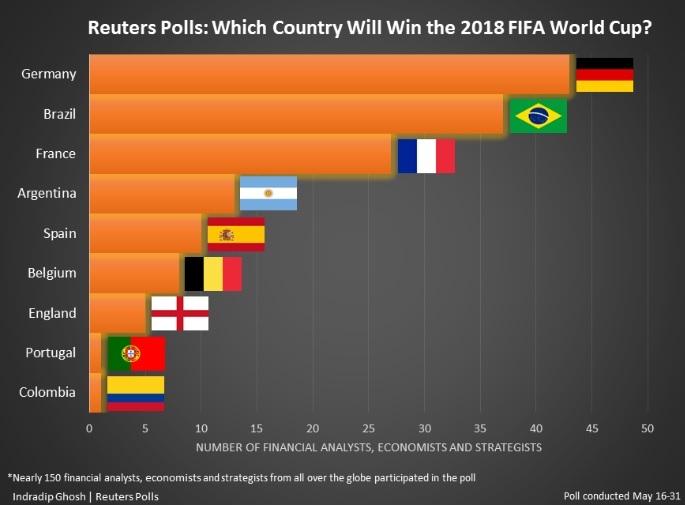 n a May 16-31 survey of regular Reuters poll participants from across the globe, Germany’s national soccer team got the highest number of nods – 43 out of 145 analysts – to lift the trophy in July. Barcelona’s Argentinian striker Lionel Messi, who has scored over 600 senior career goals for club and country, is expected to win the Golden Boot – an award for top goalscorer of the championship, last won by Colombia’s James Rodriguez in Brazil. Bookmakers agreed with strategists. The tightest odds were 9/2 on both Germany and Brazil to be crowned champions, and Messi was favorite to win the Boot. The bank’s modeling gave a 60 percent chance that one of those three teams would win. Some economists relied on their standard econometric modeling skills to predict the World Cup’s outcome.